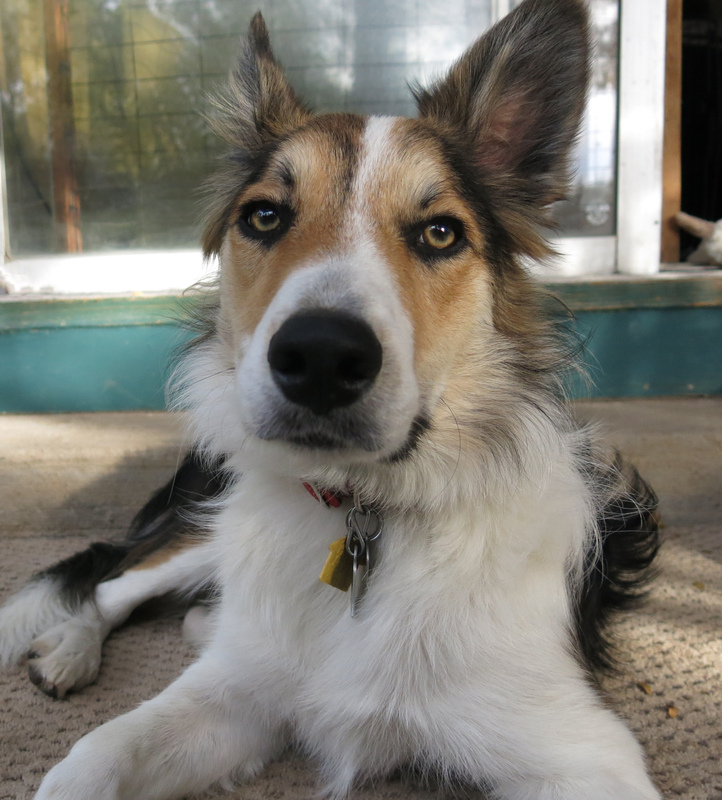 Greetings and salutations, everyone; yes, once again it is I, Mani the not-really-huge, but not-totally-miniature purebred border collie, filling in for the guy I live with, and here to bring you the latest news from our garden. 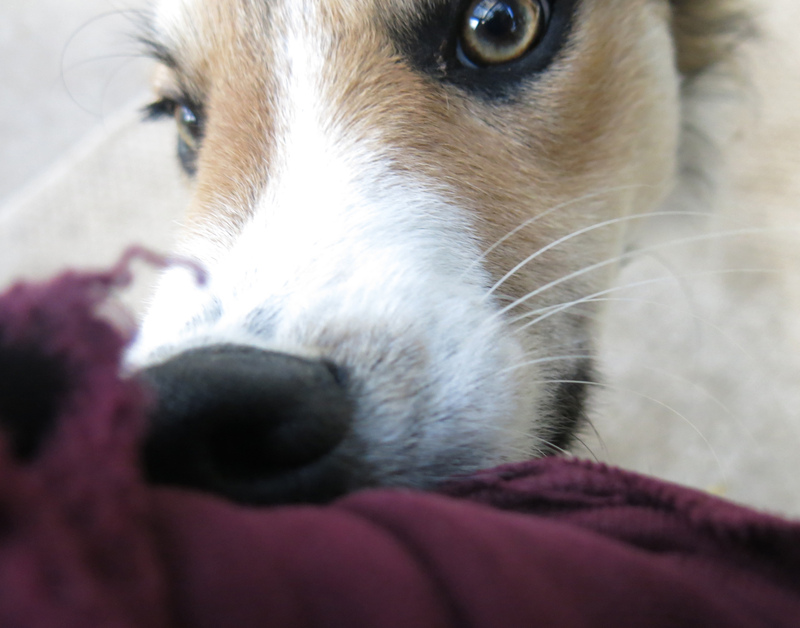 You may remember me from such posts as “Who Chewed The Hose?”, among so many, many others. Here I am in a characteristic pose. I can look thoughtful, too. I did get tired of having to sit still to get my picture taken and decided to give the guy I live with’s arm kind of a chomp. Well, anyway, I guess I need to get to my post, rather than showing cute pictures of me, but…..no, okay, on to the post. It’s been all autumnal here. You can see by this picture that it is. You can also see some crocuses if you really squint. There are actually kind of a lot of them, but the picture would have to be more in focus, and I don’t have any control over that. Here are the ones on the right, to make things easier for you. I of course can see them with no problem. There are more over here. And pretty much all over the garden. That’s what goes on at this time of year. Crocuses. 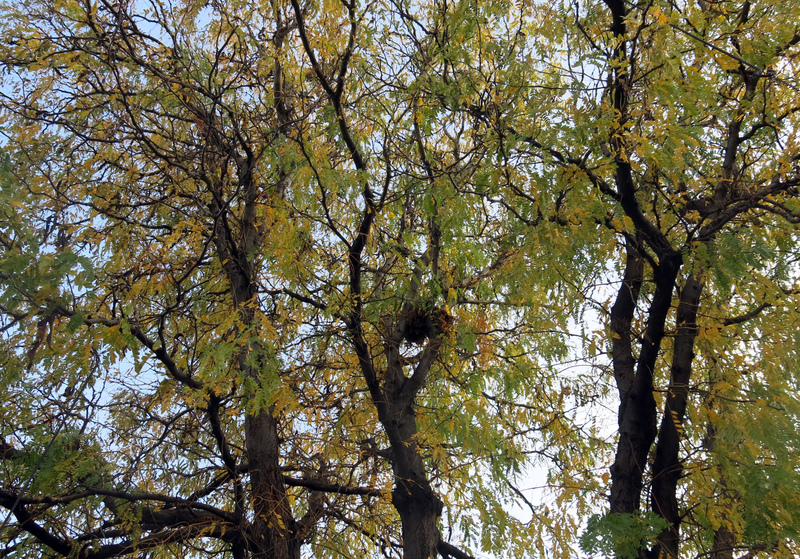 The leaves have mostly fallen off the honey locust, and most of the pods, too, though they were dropped on the ground by squirrels. They have a nest in the tree; that dark thing there. 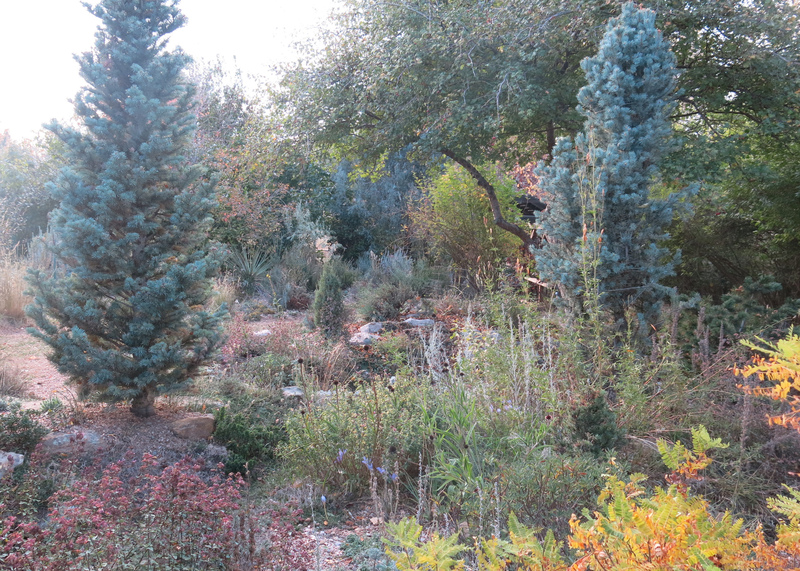 Here’s another autumnal picture, looking over the “old rock garden” to the “less old but not completely new rock garden”. The yellow foliage is from Amorpha nana. 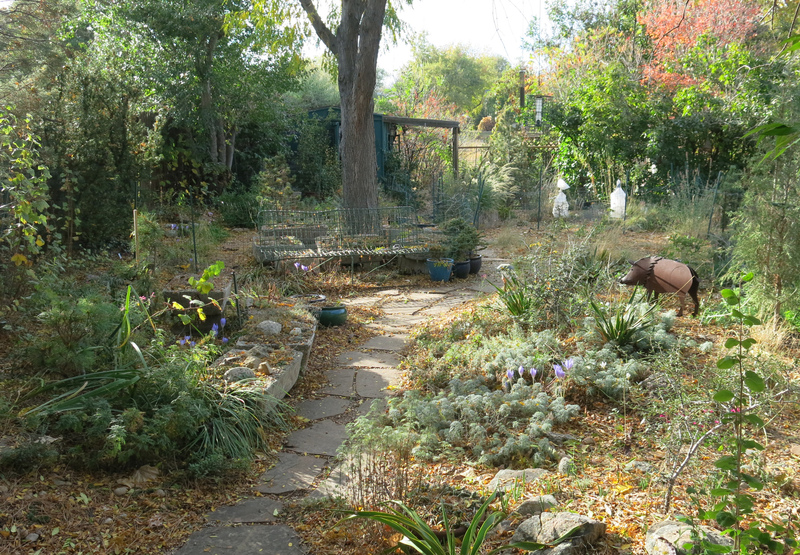 It’s been super autumnal and the guy I live with said what could be more autumnal than planting bulbs, and so he ordered one hundred snowdrops, because they were inexpensive, and decided to plant them in the back yard instead of the side. He said it wouldn’t take long to do. It took all day. Aside from the soaking (he soaked the bulbs in water for about an hour; twenty-five at a time), there was a lot of moaning and groaning about how much work planting one hundred snowdrops was. He took a lot of pretty long breaks in between planting sessions, and that’s probably why it took so long. I didn’t say anything, of course. This is partly where the snowdrops went. In that empty space. About half of them went in a space beyond where the two flower pots are. 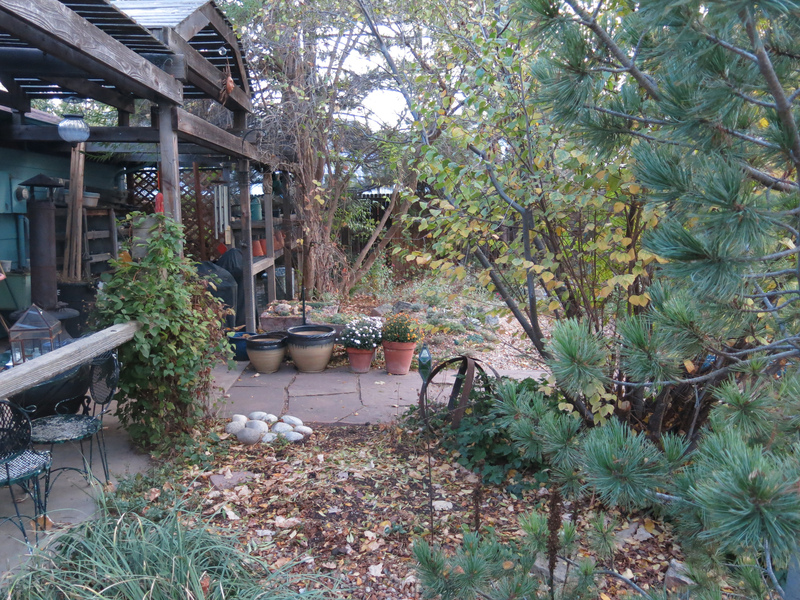 You may be wondering why there are so many empty spaces in our garden. Well, there just are. In this case, this area was covered with Lamium maculatum, which you can see a bit of just to the left of the “dinosaur eggs”, but I understand that it got tinkled on a lot by the purebred border collie who lived here before me, when he was sick and didn’t want to go out into the way back, which was okay with the guy I live with, of course. A sad story, I know, but it explains why this area is empty. There will be snowdrops there in a couple of months, unless there’s a bunch of snow. The other empty spaces are here because the guy I live with dug out plants and planned to put in others, but hasn’t been able to find what he wants, yet. If you look really closely you can see dark areas at the bottom of this next picture, which is where the other snowdrops went. This is kind of the same picture as one I showed earlier, but slightly different. Those two white plastic things, which are kind of scary, are covers for new irises. There’s always something being covered or uncovered, or caged or uncaged, around here. Or fenced or unfenced. It’s hard to keep up. 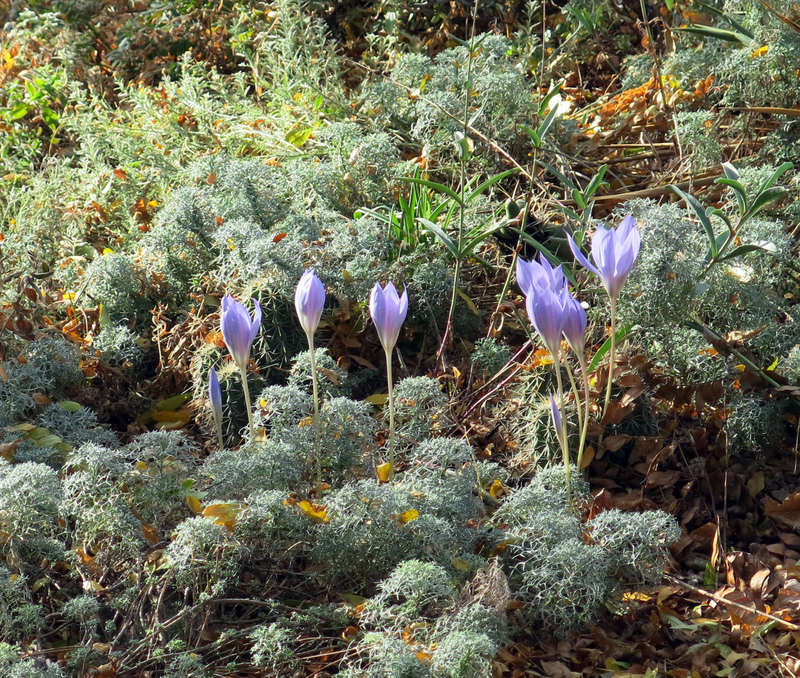 You can also see the crocuses again. The other night they said it was going to freeze, speaking of things being covered, but even though there was a lot of frost in the garden, it didn’t freeze. That is, none of the flowers froze, which suited the guy I live with, who says he would just as soon put off winter for as long as possible. I can hardly wait for winter, and snow. I’ll leave you with a picture of me, and of the fences that the guy I live with says are “putrescently hideous”. 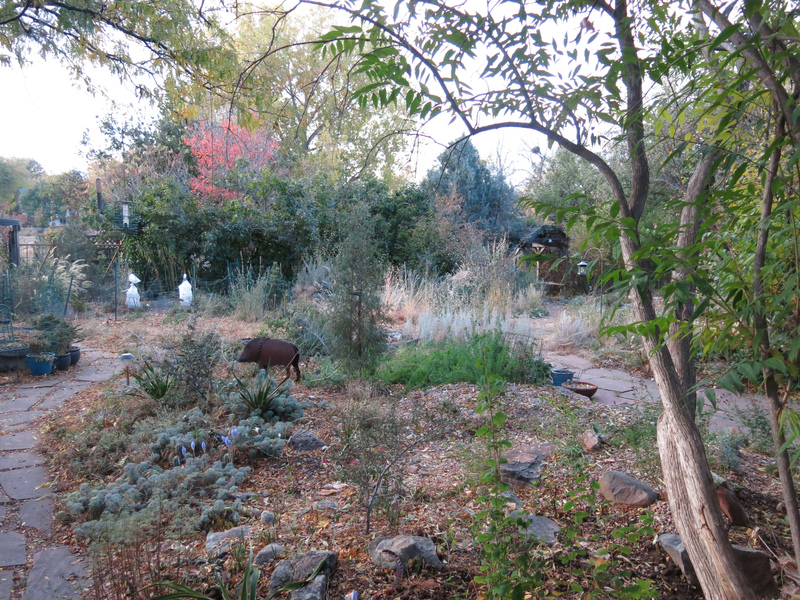 You might also notice a juniper, on the left, which wasn’t there a while ago, but was moved from the “way back”, and also a cage right in front. I accidentally pulled up a plant there and the guy I live with got all upset, replanted the plant, and put the cage there. I got a lecture, though I only heard a couple of words, and then lost interest. The guy I live with said that everything he says is worth listening to, and that’s when a little bit of doubt begins to creep into my mind, you know, and, well, I guess I’ve taken up enough of your time now. 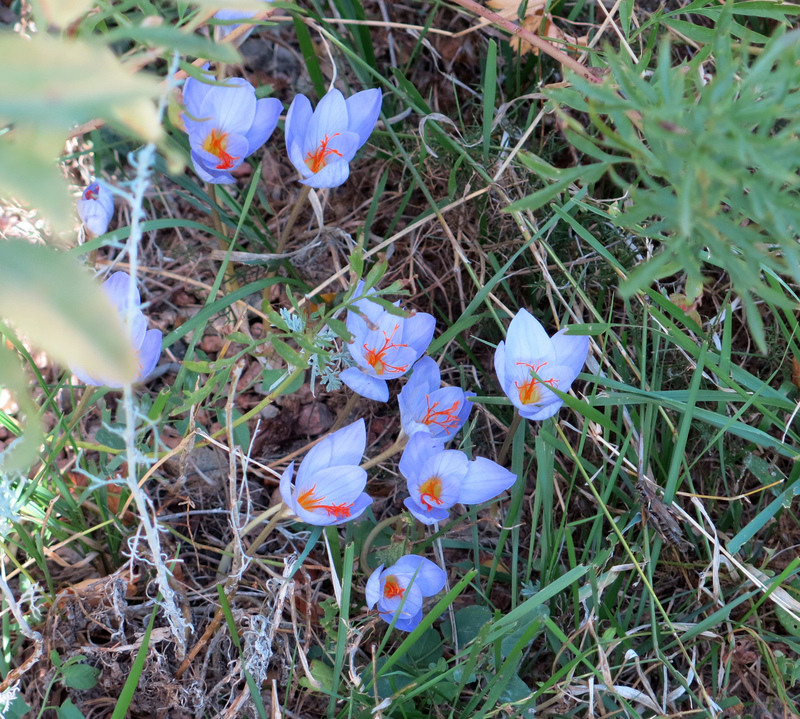 This entry was posted in Uncategorized and tagged Crocus speciosus. Bookmark the permalink. Thanks. Yes, I do get a lot of smooches. Lots and lots of them, in fact. It is Seafoam. 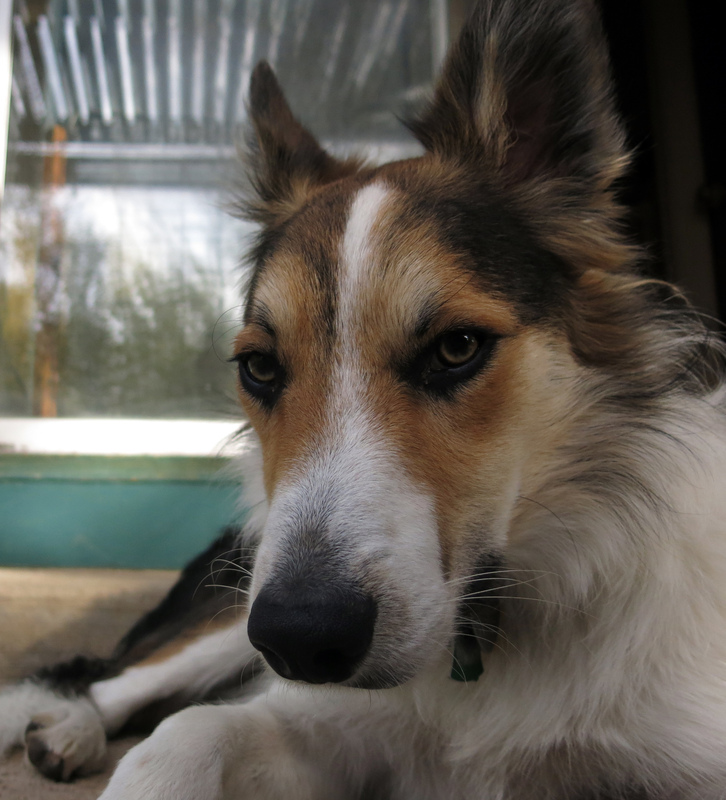 Well, you remember Chess, the purebred border collie who lived here before me? He was really sick, and a lot sicker than he talked about on the blog, because he didn’t want to drag everyone down, you know. 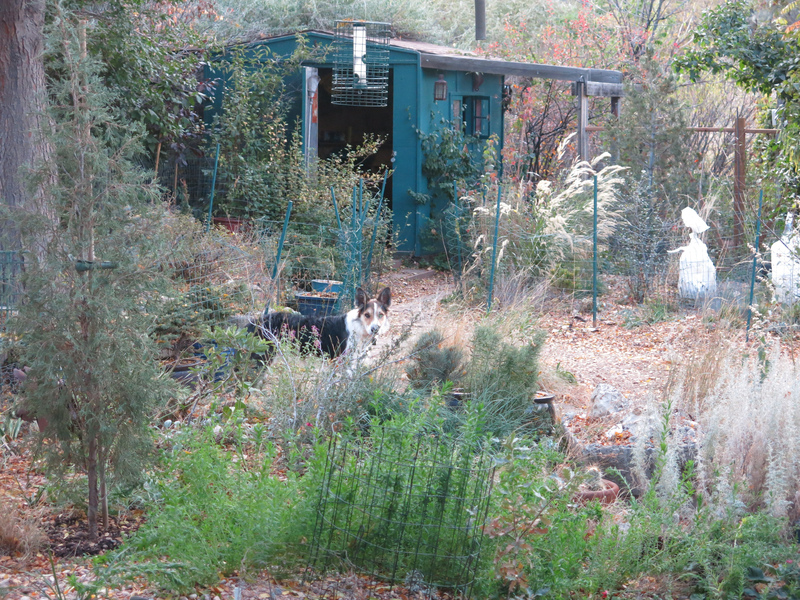 But he didn’t want to go out very far in the yard, and the guy I live with often had to help him out when he fell in the yard, and so that was okay. When he changed medications there was a lot less falling down, but he still just wanted to go there, and then come inside. And you know, I’m not really sure how that plant…it was an eremurus….got dug up. It just happened. The way things do. Artemisia alba is the similar one, not that it matters. I’m just pleased to remember something every so often. It could very well be that Silver Frost and/or Sea Foam are really A. alba. The guy I live with remembers everything. When people hear that they get all jealous and stuff, and then he tells them what he remembers, and they sometimes change their minds. I remember stuff too’ like I remember that when it rains it also thunders, which I’ve decided I don’t like at all, and it’s doing both right now. DId you get dressed up for Halloween? Do you even get trick or treaters? IF you did get dressed up, photos of you in costume would be nice. I didn’t get dressed up, but last night was pretty scary. The guy I live with told me people would come to the front door and ask for candy, but he didn’t say they would be little people wearing masks.